The AIM NetworkEnvironmentWe have failed. you know if we did every thing right 5 years ago it would get worse anyway…thats just how it is. Did you even bother to read the article or see the video Mark. Thanks, Michael, for that video. The risk/reward grid is not an entirely new concept, and the presenter made a couple of basic mistakes, but the basic argument stands that the risk of not taking of climate change action is too grave to countenance. He says “humans will survive” in his video, but this is not in any way guaranteed. See https://www.sciencedaily.com/releases/2015/12/151201094120.htm. We are talking about no less than the future of life on Earth. Mark Delmege, are you somehow *still* clinging to the claim that climate change is natural, and man has not been the primary driver? New research confirms what we already knew: the world was in a cooling phase (had been cooling for about 6,000 years) until the 20th century. Then humans started burning coal, and the trend reversed course: the world started warming. In 100 years, we have changed the climate more than nature could do in ten thousand. http://www.twincities.com/2013/03/06/recent-heat-spike-unlike-anything-in-11000-years. If instead you’re claiming that five years ago was too late for us to act, you are right: we needed to be changing our behaviour much earlier to prevent any climate change. But if we had chosen to really act following Kyoto, or at any time in the twenty years that followed, we might have met our own stated goals of stopping global warming short of the two degrees barrier. Thanks for the reminder that our ecosystem is rapidly changing due to human impact. And indeed it may be irrecoverable and lead to our extinction. My concern with people trying to reverse or slow the trend, is the paradigm. We are still trying to operate in an economic paradigm rather than an ecocentric bioregional paradigm. I feel both are mutually exclusive. Until we drop the economic paradigm I believe we are doomed. A social revolution is probably required. Ozfenric, I don’t think you are right in saying the world was on a cooling phase for 6000 years. My understanding is that the world began warming in the early to mid 18th century after the Maunder minimum of the Little Ice Age, and has continued to do so. The LIA kicked in during the 14th century. However, there has also been some anthropogenic forcing from fossil fuels, ozone depletion (continuing still), and land clearance, not to forget the influence of aircraft con trails on the upper troposphere. Mark – the biggest problem we have is not the size of the increase, but the speed of it. Life simply cannot evolve fast enough. We are at the start of the sixth mass extinction, and we are highly unlikely to survive it, no matter how smart we think we are. We were warned. Our leaders chose to ignore it, and swathes of the population bought into that delusion. And we should have a fairly good idea what happens next. Look at Syria, and multiply it. It is going to look like a zombie movie. The only survivors are likely to be those able to live off the land, which is good news for those of our First Nations, but not the rest of us. Good luck. That data is frightening. But we ought not expect the deniers to take notice. They are hard wired to believe that global warming is natural; nothing will change them, not facts, not figures, not logic, not reason. The ‘Cycles of Heaven’ are a wondrous thing. Like elliptical orbiting satellites with rotations varying from a few years out to hundreds of thousands they intereact with ever changing frequencies… nevertheless I find the best answer to those who want to deny how human activities can effect the planetary ecosystem is to remind them of Chlorocarbons and Fluorocarbons and the Ozone hole. This is what’s to be expected given the rapid development the world has experienced. This article and others like it need to be targeted to a wider audience – the question is how to do that? Messages on hot air balloons over the MCG perhaps. Sadly, we on this page will survive, so will the planet (barring north korea/iran). For me the tragedy is empty has continued the rabbott’s mistrust of science by another emptying of the CSIRO and the deposit of a venture capital leader whose expertise is in building better dishwashing liquid well not quite but he is worry????. Perhaps mark might understand that the billion of he and we, got rich by killing for fossil fuel. It is in our own interest that the other 6 billion get rich without killing for fossil fuel? Renewables will enrich the world and, until the rabbott, the CSIRO were world leaders which would have made us nearly as rich as if we had kept Telstra? It seems only appropriate that this government would respond to such a scenario by breaking the thermometer. Alan Alda is currently in Australia on a ‘Public Awareness of Science’ project. He did a radio interview (which I couldn’t find a link for) which referenced the CSIRO cuts and re prioritisation. There was, however, an article on the ABC website. “Apparently the whole Southern Hemisphere is tracked by the instruments that are losing some of the overseers by this regulation, or this change in regulations. Again, it’s not my place to get involved in politics, especially in another country, but I think the scientists who are concerned about this, who devote themselves to studying climate change, are very concerned about this, that they’re losing an important tool for understanding climate change, for having a baseline for the rest of the world. Sen I wouldn’t worry too much about NK – its a charade of sorts. ‘After all these years of tightening the screws on North Korea you’d think they would have learnt by now that North Korea always responds by doubling down on its actions and rhetoric. Or is it the case of ‘creative tensions’ and as one US diplomat said ‘I we didn’t have a North Korea we would have to invent one’. And as young Kennedy said the other day War was declared on Syria when it refused the Qatar pipeline option -which as you must know is all about hurting Russia – any way they can. Kyran appealing to the sense of an argument just because most people (even scientists) believe it true (at a point of time) is a logical fallacy. It is understandable but fortunately science moves on. Not sure I agree with you on that last point, Mark. Believing something is true because lots of other people believe it is a flawed kind of logic (that basically assumes that the accumulated knowledge of the group is more reliable than your own personal experience). However, believing something because it has been scientifically and empirically demonstrated by thousands of professional scientists over the course of decades is in a different league. Yes, science moves, and occasionally paradigms are shaken: however, each new scientific position needs to still cope with the observations made previously. The facts don’t change even when our interpretation of them does. :Put another way, I believe the safest form of modelling is extrapolation. The globe has warmed, and is warming, so it’s appropriate to assume that unless something unforeseen happens and barring deliberate actions it will continue to warm. The difference between this and prophecies of “a new Ice Age” is that the latter proposes a major change in trend. Nothing wrong with a hypothesis for a change in behaviour, but the disproof of a hypothesis, either from a single fringe scientist or from the scientific community as a whole, does not invalidate the scientific method or the hypotheses that are currently supported by empirical results. With respect, Mr Delmege, I wasn’t appealing to the ‘sense of an argument’, I was appealing to the factual base of an argument. The facts are in. That our ‘leaders’ chose to run with the only disputation offered (from the likes of the IPA who produced a ‘scientific booklet’ without a single scientist’s input) drives me nuts. The point I was trying to make is that the politicians, globally, are more interested in advancing the short term welfare of their corporate donors than the long term welfare of their constituents or the environment (both of which are inextricably linked). If the Doomsday Clock calculations are anything to go by, we have, indeed, left it to the last minute to do anything. The impediment to action are the ‘leaders’. If we are in the ‘last minutes’, it’s time to shut the idiots in a room and let them talk themselves silly or sillier). It’s time to let the scientists take control of the conversation on remedial action, many of whom have excellent proposals worthy of action, and get on with it. If you goggle ‘Royal Society’ you will find many excellent proposals. There was an article on this site some time ago, pertaining to refugee’s (I think). The premise of the article was to get the politicians out of the way because the solutions to the problems were evident and the politicians were no more than an impediment. mark delmege demonstrates that facts do not matter to him; it’s the vibe; he gets his beliefs from unusual sources, but they are still that: beliefs. He knocks those who base their beliefs on the opinions of others, but in the absence of a consideration of the facts, that is exactly what he is doing – only selectively. When he gets around to considering facts, we might listen to his arguments. With respect of population growth and climate change, we could well be at a couple of minutes to midnight (noon in the link) and be completely unaware of it. Not really Mercs. You should read what I said not what you think I said. I think we stuffed it – remember – what does that tell you? I’m just not convinced that the article or the video explain things adequately. Its complicated and I don’t know if anyone really understands the implications of what is happening. I didn’t argue that a snap ice age is upon us – not at all. And I’m not going to be convinced of an argument just because most people think one way. And I do try to live a life that reduces consumption and my footprint for a very good reason. Would it help if we were to examine the personal vested interest baggage we carry – to wipe the mind of limiting beliefs, ego reinforcement, vanity protections, wanting to be right, wanting to blame, etc at the door of the discussion room (so to speak) and proceed to engage in exploring the subject starting with the distinctions made in the video. 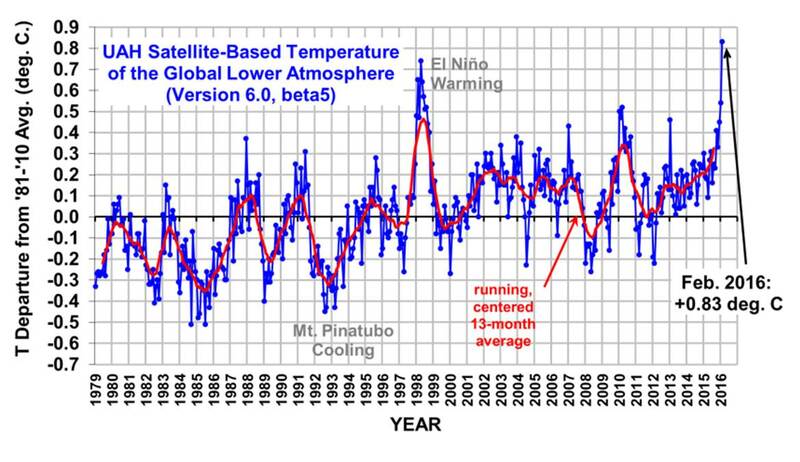 The scary thing about the presented graph from satellite data is that it has been compiled by climate change skeptical scientists Drs Spencer and Christy. Dr Karoly states that February 2016 would have been hottest recorded despite the El Nno. Dr John Christy has had some problems before with his use of data, eg refusing to provide data for some of his conclusions. You will also notice that Dr Karoly seems to treat climate change and the presence of El Nino as if they are separate events. .